On Everything Lasts Forever, Yerawadekar's songs reflect both the sounds of his upbringing in New York City’s most diverse borough of Queens, and those of his musical career working in groups such as the afrobeat juggernaut Antibalas and with artists like the Ethiopian keyboard legend Hailu Mergia. The result is a rock and roll sound that is undeniably fresh, new and hip, but with its diversity of flavors, it also has entry points for almost any listener, regardless of where they’re coming from. The 90’s dancehall rhythms of the rat race anthem “Big Time Distraction” are interwoven with bluesy guitar picking, the cumbia rhythms of the media critique “Six Shooter AKA The History Of Dance,” featuring soul singer Kendra Morris, are coupled with dub reggae stylings, and the introspective “Bad Imagination” conducts an examination of Yerawadekar’s most unnameable thoughts over a bed of lush percussion and group interplay that is impossible to nail down geographically. Everything Lasts Forever renders debates about genre moot. 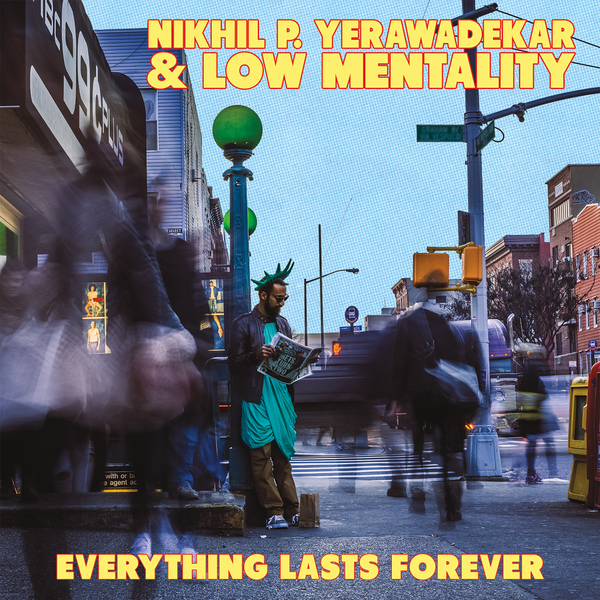 The album is Yerawadekar’s effort to understand all the material he’s collected throughout the different stages of his life, and how all the different pieces relate to one another today. With the result being a collection of danceable, memorable and personal songs, Everything Lasts Forever demands that listeners loosen up and celebrate their own lifetimes of bass heavy, funky experiences.